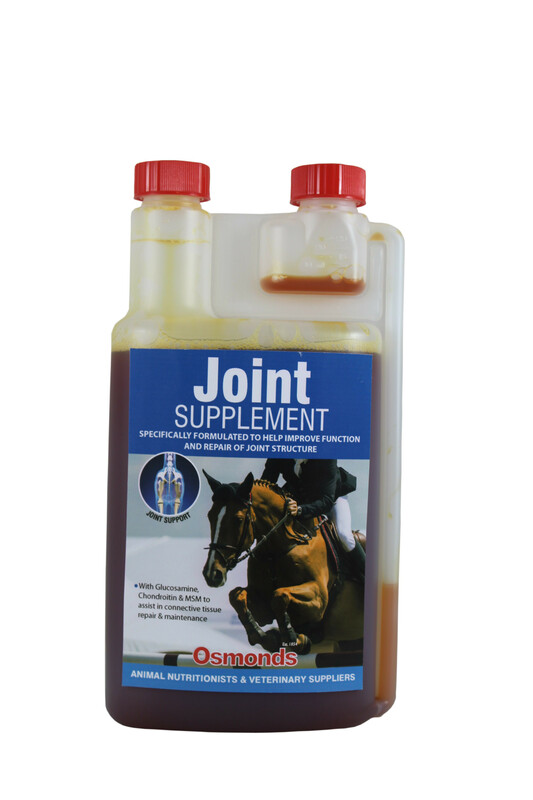 Osmonds JOINT LIQUID SUPPLEMENT is a liquid supplement providing a recommended 10g of Glucosamine per day, along with MSM, Chondroitin and antioxidant support. 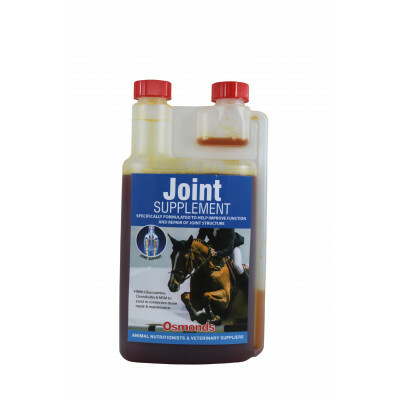 An ideal supplement for horses that may suffer from joint degeneration and associated problems, along with older horses & those exposed to high levels of concussive force. Daily inclusion in the diet may help support the joints of horses & maintain correct function. and disciplines and even those that have a weekly hack round. * MSM and Chondroitin are key ingredients for the maintenance of the joint structure. * MSM is a source of organic sulphur, an essential component of connective tissue, skin, hooves and amino acids. Sulphur Vitamin E from MSM is used in the formation of many prrotein rich structures within the body. * Glucosamine is key in the production of glycosaminoglycans, essential in collagen and connective tissue production. * Chondroitin, as well as being the major glycosaminoglycans found in cartilage, its primary function is to inhibit degradative enzymes contributing to cartilage breakdown. * Cost Effective, efficient in use.